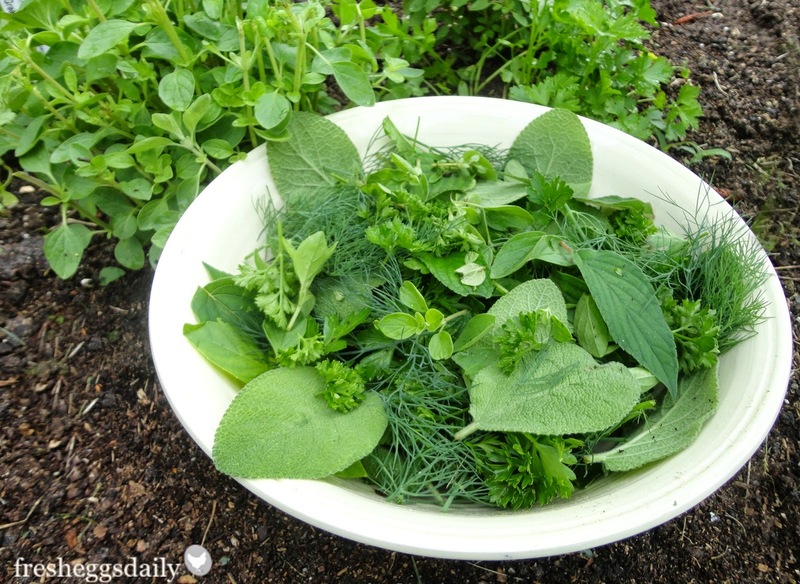 One of the many nice things about herbs is that, unlike fruits and vegetables that ripen and are harvested once, if you snip and trim your herb plants, they will continue to produce all throughout the growing season. In fact, they do far better with regular trimmings to stop them from becoming too 'leggy' and flowering. Just one basil plant can keep you in pesto all year and leave enough for you to share with the chickens as well. 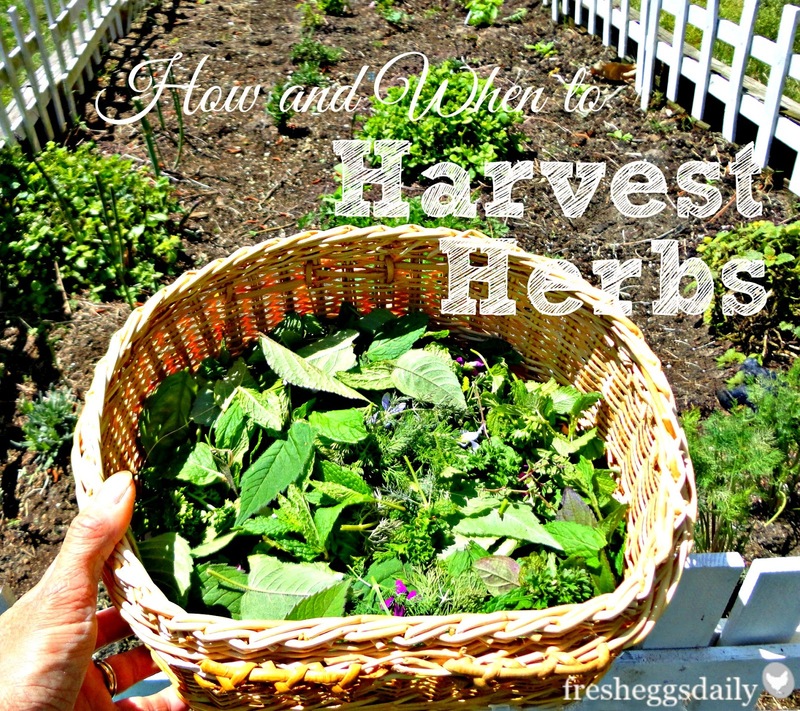 But when should you harvest your herbs? How do you harvest them? And then what do you do with them once they're cut? Well, I'll share what I do. - Trim plants in the early morning, after the dew has dried off the leaves but before the heat of the day. This is the prime picking window. 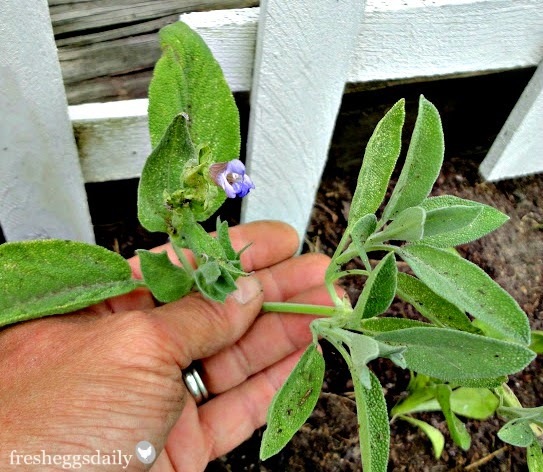 You can use a pair of herb snips or your fingers. The water-based herbs such as basil, dill, parsley and the like are easily pinched with your fingers, some of the 'woodier' herbs like lavender, rosemary and thyme are easier to pick using scissors. - Snip or pinch off the tips of the branches just above a set of leaves. This ensures your plants will grow out nice and full and bushy instead of tall and lanky. As a general rule, take only 1/4 of any one branch to allow the plant to continue to thrive and branch out. - Trim herbs before they flower. This ensures maximum flavor. However, if you are trying to attract butterflies, bees and hummingbirds to your garden, and feeding the herbs to your chickens (instead of making your prize-winning pesto! ), by all means let some flowers bloom. The beneficial nectar-loving bugs will thank you - and so many of the herbs do have beautiful flowers. - Choose nice, large leaves. If you're merely picking a few leaves here and there, choose the largest and leave the smaller to grow a bit more. - Remove the leaves from the stems and discard the stems. - Brush off any dirt. You don't want to rinse off the leaves. This can lead to molding instead of drying. - Dry what you've picked. 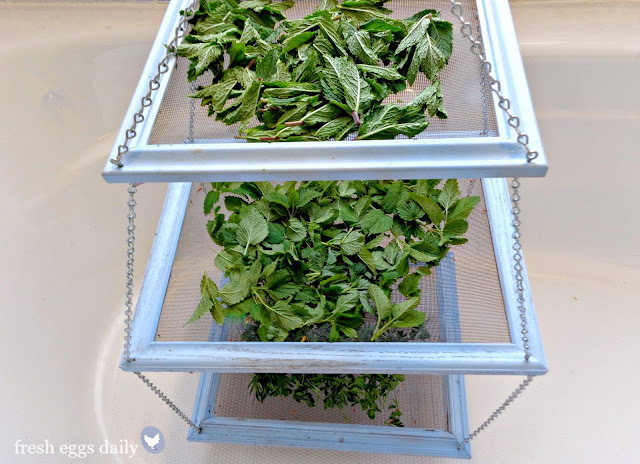 Most herbs air dry quite quickly when spread out on a kitchen towel or paper towels laid over a wire rack, hanging them in bunches, or you can make a tiered herb drying rack like the one I use. - Turn the leaves occasionally (if air drying) to be sure they dry completely and evenly. - Crush the leaves with your fingers when the leaves are completely dry and store them in a sealed container in a cool, dark location. They should be used within about a year for maximum flavor. Of course, fresh and dried herbs are a must in any kitchen to boost the flavor of your favorite dishes. I'd love to hear your favorite herbs and how you use them! Join me here Facebook | Twitter | Instagram | YouTube| Newsletter ©2015 by Fresh Eggs Daily, Inc. All rights reserved. Thanks for the herb tutorial!! I've heard you mention feeding herbs to your chickens before and I have been trying that a bit. Of course my herb garden is not in full swing yet but I have some that over wintered. Mine have tried lemon thyme and basil. They like those. I offered mint for the first time yesterday. At first they were not at all pleased. When they came back a second time for a check they decided the leaves were worth fighting over. I'm definitely going to grow more herbs for my chickens now! This was exactly what I was looking for. I just planted my first herb garden this year for cooking for mainly for my first litter of chicks. Overall I've had good luck with them (knock on wood) but my lavender and sage are looking puny. I was looking for a good tutorial on exactly this topic! Thanks as always! Excellent info, Lisa! Abi has been using our mint to make a knockoff of Starbucks' Coldbuster Tea, and I was getting worried that my plant would be exhausted before she got well again. Now I see that we ought to only be taking 1/4 of each stem, versus the whole stem. So glad I decided to read this today. !!! How (Dr.Ukaka) Help Me Save My Marriage & Avoid Divorce !!! “LOVE is the key to LIFE” Glorious be unto Dr. Ukaka the great man and ever, my name is Lisa Buckley from Taxes city Usa. since 1 and a half year I have witness what is called heart broken. my boyfriend that promised me marriage failed me and impregnate me and leave,he dump me,he stop calling" he stop picking my calls,and he no longer respond to me. I have be looking for solution,I fall into the hands of fake spell caster,they rough me off and took my money without help.I have cried,I have weep"and tears runs out of eyes. The silentness in my heart brought me to the deepest path of failure that I lost my job. Crying all day,because of my life was lonely. So thanks to Ukaka that came into my life and brought me the greatest joy that was lost. I saw his mail while browsing and I contact and tell him what I am passing through with no doubt because what saw about him,was enough to believe. And I was given words of solution on what to do. I can't really help thinking about it I have tried to see what I can do, I manage to provide him some materials and he help me with the rest,after casting the spell, 12hrs later he came with rose on his hand and I was even about going out,i saw him in front of my door when he sees me he knee and said he is dying I should forgive him and accept him back he was crying,I can't wait to let him finish I quickly crab him and kiss him, just then" he said he is restless without me, just as the prophet has said he will be. He brought out a ring and put it on my hand. Our wedding day was scheduled,1week after we got married. today makes it 2weeks and we are living happily I don't know how to praise him enough, he has done me a thing I can never forget. And I can't really share to myself alone, I want y'all to help me praise him because if it is wasn't for him I already plan of committing suicide. But right now I am now so happy more than I was before. And you out there crying for help you've already got one,Ukaka is the man that you need in all rampart. contact his address if you need his service, freedomlovespell@hotmail.com also contact him on his web site: freedomlovespelltemple.yolasite.com also call Dr.Ukaka on his mobile number +2348133873774),,. Oh good! Mine don't love mint so I'm not surprised yours weren't head over heels, but I do find when I put it in the nesting boxes, its soon gone! many people, I'll never forget. (2) if you ever have nightmares. (3) Want to be promoted in his office. (4) Do you want women / men to run after you. (8) If you need financial aid. (10) You need a spell to stop divorce? (11) has been sick or dis-power and needs healing? I AM JUSTINA PETERSON FROM UNITED KINGDOM!!! i am very grateful sharing this great testimonies with you, The best thing that has ever happened in my life is how i win the lottery. I am a woman who believe that one day i will win the lottery.finally my dreams came through when i email Dr OKAYA . and tell him i need the lottery numbers. i have come a long way spending money on ticket just to make sure i win. But i never know that winning was so easy until the day i meant the spell caster online which so many people has talked about that he is very great in casting lottery spell And love spell , so i decide to give it a try.I contacted this man and he did a spell and he gave me the winning lottery numbers. But believe me when the draws were out i was among winners, i win $2,000,000:00usd . Dr. OKAYA truly you are the best, with these man you can will millions of money through lottery. i am so very happy to meet these man, i will forever be grateful to you. Email him for your own winning lottery numbers OKAYASPELLHELP@OUTLOOK.COM or call him +2348078291904. JUSTINA PERTERSON FROM UK ..